Park benches from the Huntington Collection are extremely well-suited for a wide range of uses from indoor lobbies and hallways to outdoor parks and plazas. Mid-century geometric elements interfused with modern industrial flair, ready to transform and revitalize the overall appeal of contemporary bench seating areas. The bench frame is purposely engineered with built-in footings that are conveniently adaptable, amply accommodating for both surface mount installation and portable capabilities. 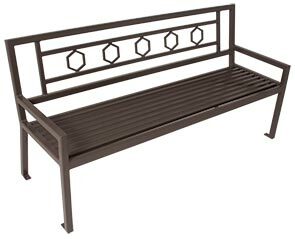 Constructed with top grade steel, offered in 2', 4', 6' and 8' bench seat lengths and available in a popular assortment of ultra-durable powder-coated color options—the Huntington Collection is equipped to deliver on lasting upscale impressions. These premium park benches are great fit for both individual placement and for large scale multi-site furnishing with matching backless park benches, trash receptacles and tables with chairs.